What makes a great Fourth of July movie? It has to be a summer tent-pole flick, sure. It has to be big – with top stars, obscene budgets, and an A-list director. But it also needs to capture something else to be a really good July 4th event. It needs to have a theme that resonates with the American character: something about patriotism, or heroism, individualism, or just plain goofy joy. It needs to have a really imaginative, scary, menacing bad guy: an invading army, a killer animal, an unstoppable machine, icky bugs, an evil genius, a big rock about to destroy the world. It needs to set these two forces up in opposition, so that the American heroes are tested sorely, the big-bad-world-destroying whatever is about to crush/eat/destroy everyone, and our heroes rescue the world but not without some serious loss of life. And it needs plenty of fun and fireworks – sarcastic quips, things going boom, laser beams, rock music, and maybe some beer and cigars. It essentially needs to be a big block party/fireworks show on a movie screen, and it needs to be really really fun. 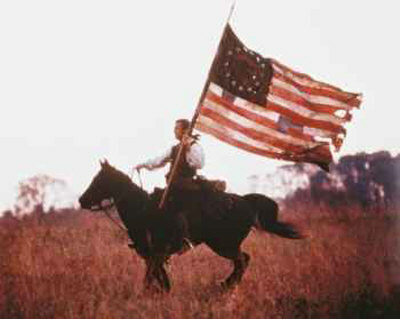 With this in mind, then, I unveil my selections for the top ten 4th of July movies of all time. Please feel free to comment or add your own suggestions in the comments section at the end. 9. Live Free or Die Hard (2007) – This fourth installment of the Die Hard franchise opened the week before the 4th and posited a technological “fire sale” that causes mass chaos by shutting down the power grid. Invokes a nice sense of America’s new-found fear of going dark. 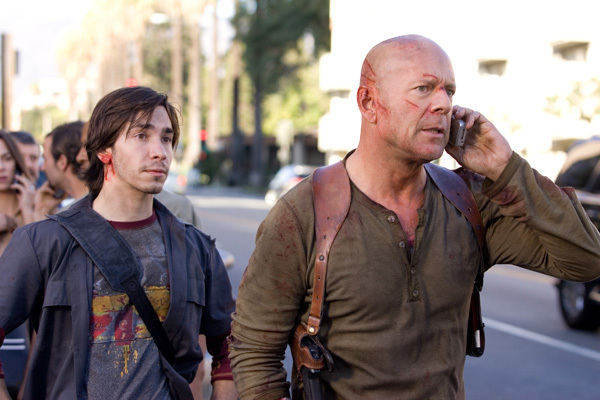 Also a nice combination of Justin Long techno-geek wiz-kid-ism with old-fashion beat-em-up Bruce Willis stunts. Features a cool villain in the form of Timothy Olyphant as a villainous super-hacker and some great old-fashion flying car crack-ups and blown-up buildings, it successfully rebooted a long-in-the-tooth franchise. 8. Armageddon (1998) – Jerry Bruckheimer has seemingly staked a perpetual claim on 4th of July weekend with the Transformer movies, but Armageddon is probably the his better entry. There’s nothing like saving the world from an impending asteroid to stir up the appropriate jingoistic joys. This movie – like most Bruckheimer fare – is a bit too self-congratulatory for me to fully enjoy (the slow-mo hero shots go on interminably), but it does capture the spirit of the weekend well, with a classic Aerosmith soundtrack and plenty of fresh corn from Bruce Willis. 7. Spider Man 2 (2004) – The original Spider Man debuted to block-long crowds and rave reviews. It was the first time a comic-book movie had “heart” – or enough character development to make you both thrill and cry. Most important, the movie struck at the heart of teenager-dom and hit a chord with young audiences and adults alike. 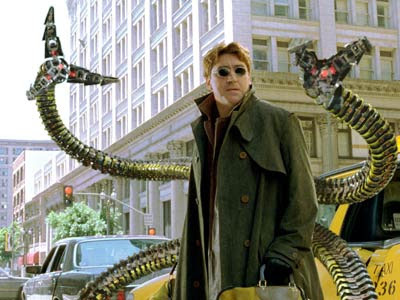 Spider Man 2 reprised the magic on the 4th of July with a better villain (Doc Oc) and some serious soul searching for Spidey. 6. Terminator 3: Rise of the Machines (2003) – Once more into the breach, dear Terminator. This time, new director Jonathan Mostow gave us a lovely but deadly female Terminator with flaming firepower and some great careening chases. It was what we’d come to expect from Terminator movies, but it delivered. 5. The Patriot (2000) – Mel Gibson and a hot new kid named Heath Ledger teamed up to give us a unique poli-sci lesson on the American Revolution (a subject one might think would be more popular this time of year). This film stays away from history class clichés by illustrating a family of young fighters and an American army more suggestive of a terrorist insurgency than the organized military we know today. Intriguing and filled with enough battles to qualify it as “action packed,” the real heart of this film was Ledger, who with his soulful eyes and youthful vim stole the show, and established himself as a leading talent. 4. 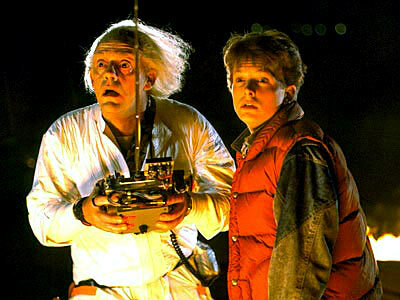 Back to the Future (1985) - Marty McFly won our hearts with his skateboard and time-traveling Delorian in the first movie that really set out from the start to create a fourth-of-July weekend craze and delivered on its promise. That makeup to age his parents wasn’t too convincing, but boy did that time travel paradox of Marty interrupting his own insemination make us scratch our heads. The movie may seem tame, now, but is was racing to catch lightning, and it did. 3. Terminator 2: Judgment Day (1991) – The first Terminator was a cult classic, but when James Cameron came back to reprise his surprise hit from a decade before, you knew he was after something both new and big: and he didn’t disappoint. Terminator 2 took the idea of the metallic unstoppable killer and “kicked it up a notch,” creating a coolly modern, seemingly indestructible and infinitely adaptable silicon assassin and an endless chase scene that decimated cars, houses, buildings, trucks, and pretty much anything in its path. The brilliantly staged assault on the Cyberdyne building was an instant action-flick classic and has served as a blueprint for numerous top sci-fi battles, including the Transformer series, the Matrix movies, and too many others to count. 2. Independence Day (1996) – One of only two movies on our list that actually takes place over July 4th weekend, Independence Day was both an end-of-the-world sci-fi thriller and a feel-good all-American celebration of patriotism. It simultaneously resurrected the destruction/disaster movie and established Roland Emmerich as a tent-pole director (though it’s seemingly all been downhill for him since then). Independence Day’s scenes of iconic buildings being blown up by invading aliens set the tone both for future summer movies (Die Hard 4 gives a knowing nod) as well as our reaction to real-life terrorism (many people I know compared watching September 11th to this film). 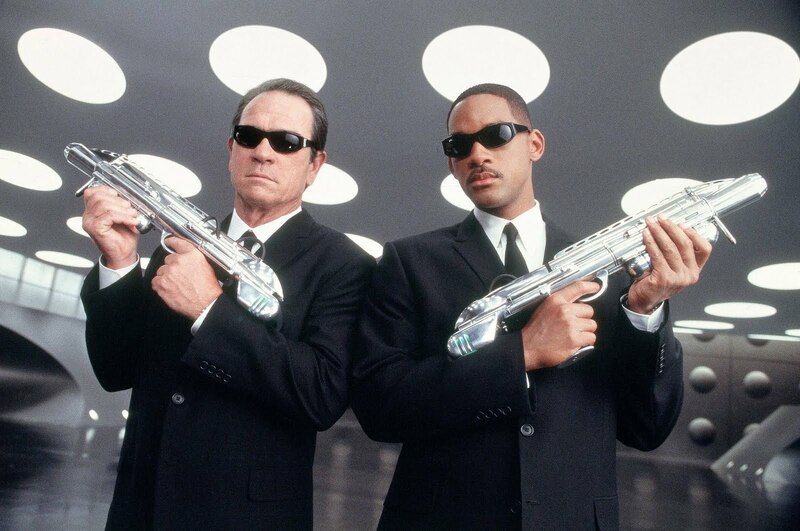 Helmed by Will Smith at his peak, with a snarky Jeff Goldblum to boot, this one is perhaps the perfect blend of popcorn, fireworks, and summer sci-fi. 1. Jaws (1975) – Released in the second half of June, the movie takes place over the 4th of July weekend, and it was the same weekend in 1975 when Jaws became a smash hit and literally invented the summer blockbuster. Spielberg practically created the classic villain with his seemingly intelligent killer shark (which we hardly ever got to see) and that iconic music. Probably the perfect thriller, no one will listen to Roy Scheider’s police chief Martin Brody as he struggles to close the beaches – no one, that is, but a hippie oceanographer and a scrappy old fisherman. When they three of them go out to face the shark alone, the movie becomes pure genius. Next time you hear the phrase, "we're going to need a bigger [fill in the blank]" in a movie, you can tell 'em that this was the one that started it all.